Beautiful spiral. Makes me think of a snail's shell. Very nice lines. I enjoyed your recent shot of NYC, too. Great photo of the spiral staircase. It does make me think of a nautilus, too. Sandy: It does look like a snail's shell. Spiral staircases are so intriguing. Digital Flower Pictures: Thank you for the compliment. I like the lines too! Sukhmandir Kaur: Hold on tight, don't look down, and enjoy the journey. Catsynth: Check out the Mechanics Institue Library whenever you're in downtown San Francisco. 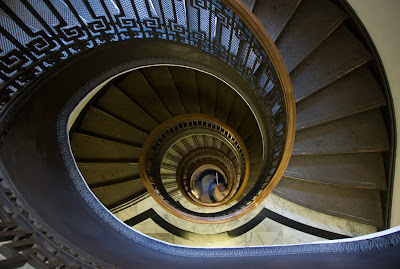 It is probably one of the most unique spirals in the area. That is so nice, I would love to be there and have a stroll down the stairs! That is quite a spiral. What a gorgeous spiral!! It really is a great shot! Wow, Karen, what an awesome shot. I love it. Nice. Reminds me of forms in nature like snail shells. You think maybe that's where the architect got the idea? A classic subject - and very well done too. Beautiful shot. It's a great spiral. I love the architect's use of the Greek key on the railing which is so reminiscent of the spiraling pattern. Imagine having to walk up and down those flight of stairs! Well good exercise..